Jerry Kenney is a travel writer in Northern California. He is a frequent traveler. He has been on all the seven continents and visited 125 countries in every parts of the world. My wife and I visited the Chernobyl Museum in Kiev, Ukraine in August of 2013. Our tour group met Anatolly Koliadin, who had worked in the nuclear power plant during the disaster. Our guide translated as he talked to us. 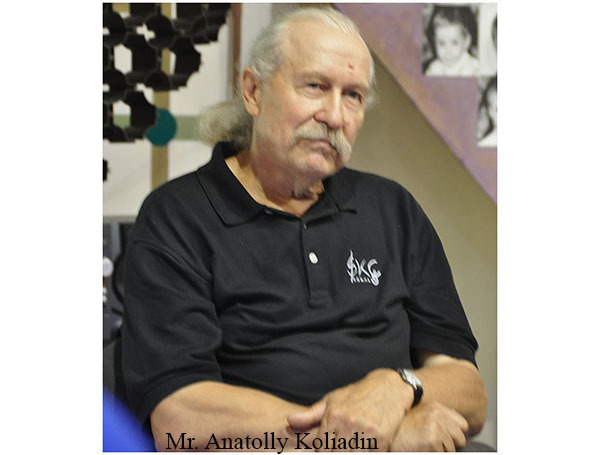 Anatolly Koliadin, an electrical engineer, was born in Russia. In 1985, he was sent to the Ukraine to work at Chernobyl Nuclear Power Plant. His job was to manage alarms and the electronic systems used to monitor the performance of the four nuclear reactors. Anatolly was at home with his wife at 1:23 a.m. on April 26, 1986, when the nuclear power facility experienced catastrophic failure. Because it was pitch dark, and all electrical power was immediately lost, no one could see precisely what had happened. To address the lack of information and the potential danger, Chernobyl’s managers established three priorities. The first priority was to put out the fires. The thirty-one men who fought the fires during the first five hours following the explosion were forced to rely on flashlights to see in near- total darkness. Most of these men wore only leather aprons for protection, and were exposed to high levels of radiation. All of these men died from radiation sickness - most within a few weeks of the explosion. The second priority was to restart the flow of water used to cool the reactor to prevent a meltdown. Anatolly and his team quickly discovered that this was impossible because all of the water pipes, electrical wiring, and remote controls had been destroyed by the explosions, and the meltdown of reactor 4 had already occurred. The third priority was to survey damage to the facility. A team was sent into the badly damaged reactor that contained high levels of radiation and deadly gases. They had to wade through radioactive-contaminated water. They quickly learned, "Get a scrape, you lose a limb; get a wound, you lose your life." Helicopter crews photographed the damage and measured radiation levels outside the reactor. All of these brave men paid a high price. Twenty-eight men died during the first four months following the disaster. Over time, forty-five percent of the men involved in the clean-up died from exposure to radiation; and many of the survivors, including Anatolly, have suffered from cancer for decades. The magnitude of the disaster was enormous. The massive concrete and heavy steel containment building that covered reactor 4 had been completely destroyed by the fire and explosions. Reactor 3 was damaged by shrapnel from these explosions. Mikhail Gorbachev and the Soviet authorities delayed the release of information about the disaster for weeks. As a result, five million Soviet citizens were exposed to higher than normal levels of radiation. 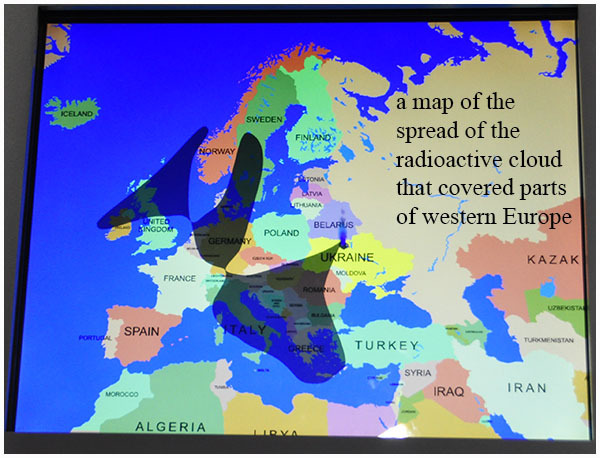 Nineteen days after the catastrophe, winds carried radioactive particles north to Sweden, where technicians at a nuclear power plant traced the high levels of radiation to Chernobyl. After being sent home by doctors in 1986, Anatolly returned to work at Chernobyl in January of 1987 because he needed money to provide medical care for his family. His wife has had two strokes, heart problems, and suffered intense emotional stress from the disaster. His children have had life-long medical problems, and Anatolly has battled cancer and depression. Anatolly became a leader of an organization that represents the interests of the members of the Chernobyl clean-up crews. As a public service, he talks to visitors. There is good news - his daughter is a doctor and he has a grandson. Further good news is that there have been far fewer cases of cancer than projected at the time of the disaster. Anatolly Koliadin has very strong feelings about the future of nuclear energy. "Nuclear energy has inescapable dangers. We should eliminate the use of nuclear energy, and only use solar, wind, and other safe sources of energy." While working on the story of the disaster described by Anatolly, I read a recent scientific analysis, "Live Science – Chernobyl: Facts about the Nuclear Disaster" by Marc Lallanilla. It has taken years for scientists to piece together the sequence of events that led to the greatest technological disaster in human history. Extremely hot nuclear fuel rods were lowered into the cooling water too quickly, producing excess steam that caused a power surge. The first explosion blew the 1,000-ton plate off the top of the reactor. This explosion cut off the flow of cooling water, and resulted in the meltdown of reactor 4. A few seconds later, a second explosion of even greater power blew-up the reactor building and the surrounding containment structure. Radioactive isotopes of iodine and cesium were released into the atmosphere along with high levels of radiation.